A tough, durable but exquisitely skilful half forward flanker, Doug Barwick enjoyed a successful eight-season career in Victoria, including membership of Collingwood’s drought-breaking premiership in 1990. Born in 1962, Doug Barwick’s senior football career began with East Launceston in the NTFA in 1980. He spent four seasons with the Demons developing into a versatile young player, ultimately claiming the club’s Best and Fairest award and representing the association in 1983. By this time the VFL had begun to show an interest in the youngster, and Barwick subsequently signed with Fitzroy ahead of the 1984 season. Barwick made his senior debut for the Roys in the opening round of 1984, kicking three goals in his side’s 49-point loss to Geelong at Kardinia Park. Over the following four seasons under legendary coaches Robert Walls and subsequently David Parkin, Barwick made a name for himself as a brilliant half forward/ruck rover with a keen eye for goal. He would boot 127 goals in his 76 games with the Lions, with a best of seven against the Brisbane Bears in 1987, a season in which he would achieve a career-high tally of 47 goals (second at Fitzroy behind Richard Osborne) and represent Victoria in a State of Origin clash against South Australia in Adelaide. 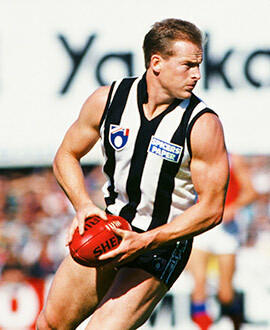 On the back of this success, Barwick made the short move across to Collingwood ahead of the 1988 season, one of three Tasmanians to join the Magpies that year. After enjoying moderate success in his first two seasons at Victoria Park, Barwick achieved the boyhood dream in 1990, as he and his teammates celebrated bringing an end to the 32-year ‘Colliwobbles’ courtesy of their 48-point Grand Final win over Essendon; Barwick had the distinction of booting the goal that officially saw Collingwood home, snapping a goal from the forward pocket in the last quarter after receiving a handpass from Denis Banks. 1990 also saw Barwick represent the state of his birth for the first time, kicking two goals – one of which was a monstrous torpedo from 55 metres – as the Tasmanians stunned Victoria by 33 points in front of 18,000 ecstatic locals at North Hobart Oval. Sadly after the euphoria of 1990, both Collingwood and Barwick endured seasons they would like to forget in 1991. Collingwood suffered a classic premiership hangover, finishing 7th to miss the finals, while Barwick’s year was ruined by injuries which restricted him to only nine games and none after round 12, although he did manage another State of Origin appearance for Tasmania against Victoria. Barwick decided to retire at season’s end, ending his AFL career after 147 games and 218 goals. Post-AFL career, Barwick returned to Tasmania, ending his playing days with five seasons at South Launceston in the TFL, hanging up his boots at the end of the 1996 season. He subsequently returned to Victoria, eventually embarking on a long and distinguished coaching career. Stints as senior coach with the East Burwood FC in Victoria’s Eastern Football League were followed by periods as a line/assistant coach with Eastern Ranges in the TAC Cup as well as Box Hill and Williamstown in the VFL. His impact at East Burwood was enough for him to be names coach in the club’s Team of the Decade from 2000-2010.